This village is on the northern side of Sea of Galilee, and was the center of the activities of Jesus and his town during that time. 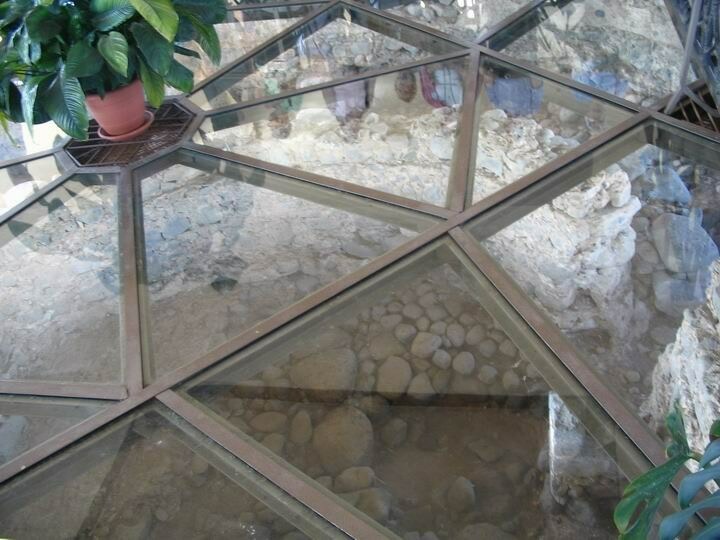 A grand 4th century Ad Synagogue was excavated, which stood over the Synagogue from the time of Jesus. Matthew 4:13: "And leaving Nazareth, he came and dwelt in Capernaum, which is upon the sea coast, in the borders of Zabulon and Nephthalim"
The site is located at the north corner of the Sea of Galilee, on the side of the ancient road from Tiberias to the east of the sea of Galilee: Golan, Gamla and Jordan. 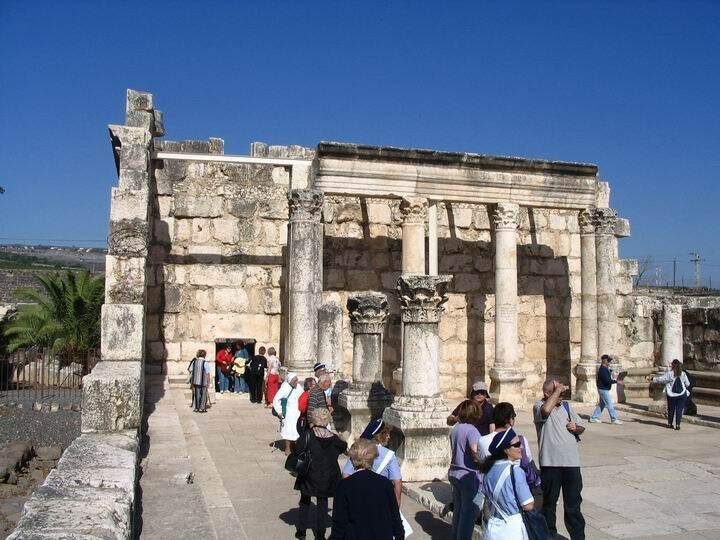 Note that in Capernaum there is also the Orthodox Church, located on the eastern side of the ruins. 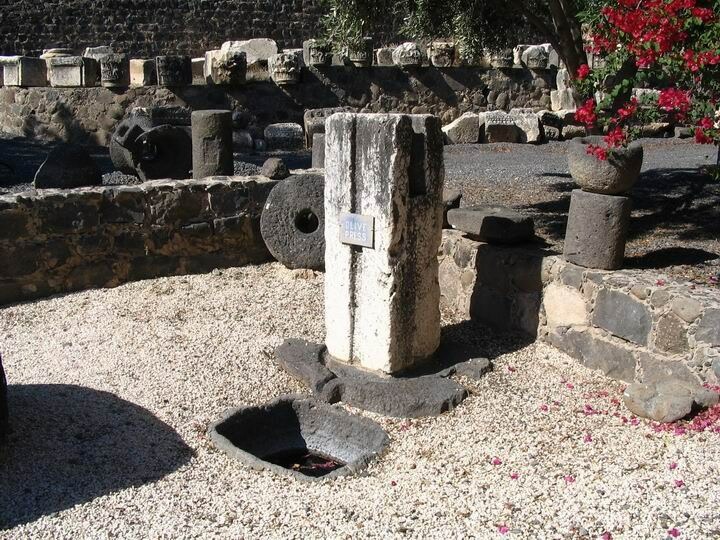 Capernaum was the center of Jesus activities in the Galilee and his town during that time. Jesus taught in the local synagogue. It was also the home town of the apostles Peter, James, Andrew and John, and the tax collector Matthew. Capernaum first started to be inhabited during the 3rd Millennium BC in the early Bronze period. It was a small village of several houses, which was in the area controlled by the Biblical city in Tell Kinneret, located 3 KM to the west. It continued through the 2nd Millenium, as surfaced in the excavations, in the area around the center of the Roman village. During the Israelite/Iron period (1200-587 BC) there was a break in the population, which was restored in the 5th century BC (the period of the returns of the exiles to Zion). 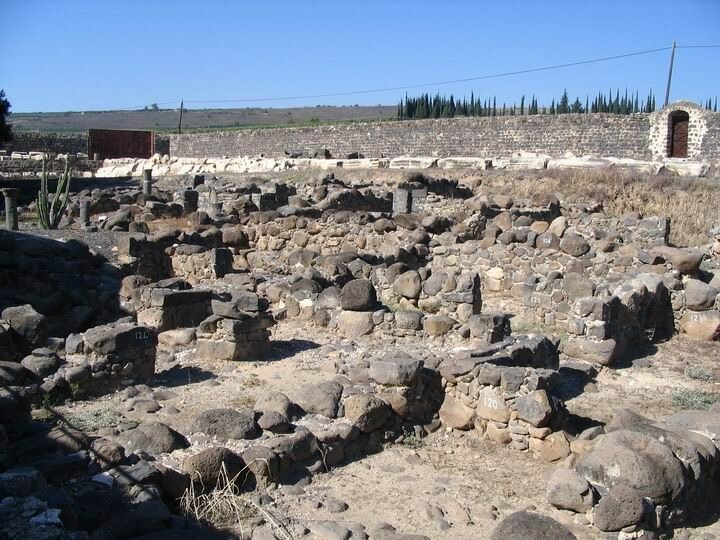 The village then expanded in the Hellenistic period (4th-3rd century BC), gradually replacing the focus from Tell Kinneret - as most of the Tells in Israel at that time. It was designed according to that period's urban design of straight lines, which was built in parallel to the main Roman imperial highway, that crossed the village on the northern side. 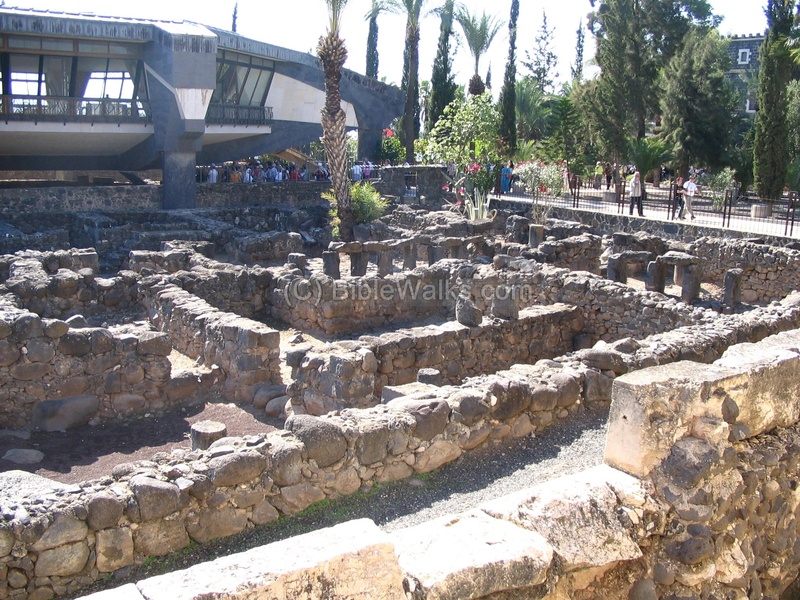 Capernaum grew larger at the time of Jesus (early Roman period, 1st century AD), and a synagogue was built in the center of the village. It reached its peak in the Byzantine period when the grand white-stone Synagogue was built (end of the 4th century AD) over the earlier synagogue. An octagon church was built in the 5th century AD at the location of St Peter's house, and serviced the Christian citizens. At that time the village covered about 60 Dunams (6 Hectares), with a population of about 1,500. Note that the excavated area that is seen today is only 1/3 of the entire size of the village. Capernaum was partially destroyed in the Persian conquest in the 7th century AD. The synagogue and church were destroyed in the Arab period (7th- 12 century AD), but the village continued to function for some time. It then was totally ruined. The area was purchased by the Franciscans in 1894; 2/3 of the entire area of ruins were purchased, while the other third was purchased by the Greek Orthodox. The excavations were conducted in several seasons (1905-1915, 1968-1984). An aerial view, as captured from a quadcopter from the northeast side, is seen here. 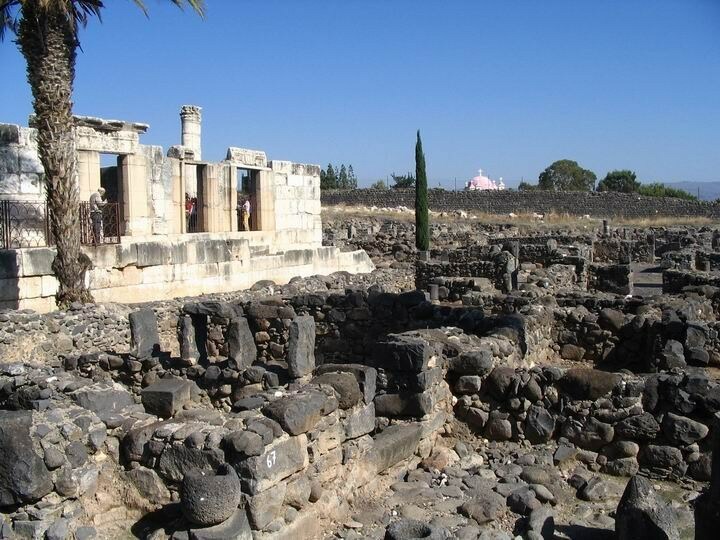 Ruins of ancient Capernaum are located inside the compound and in the area around it. In the center is the white building of the Late Roman synagogue, and closer to the lake is the Octagon church (St. Peter's house). The next photo shows the center of the village from ground level, with the 4th century AD synagogue on the left. On the right side are the Byzantine ruins of the village in the center, which occupied the same area as of the early Roman houses (from the time of Jesus). In the background, past the walled area, are the pink capes of the Greek Orthodox church. Who can type my essay as urgent as possible? FastEssay.com is probably the best choice for you. The Synagogue was built at the end of the 4th century AD (Late Roman period). In the photo below - the main prayer hall. This building was built from white limestone, which is in contrast with the local black basalt buildings. It had a roof, which stood over the pillars that are seen in the hall. Along the eastern and western aisles (seen below) there were stone benches. The next photo shows the wall between the main prayer hall of the synagogue and the eastern courtyard. Parts of the synagogue stones are displayed in the area around the excavations, such as this element which shows the ark of covenant. 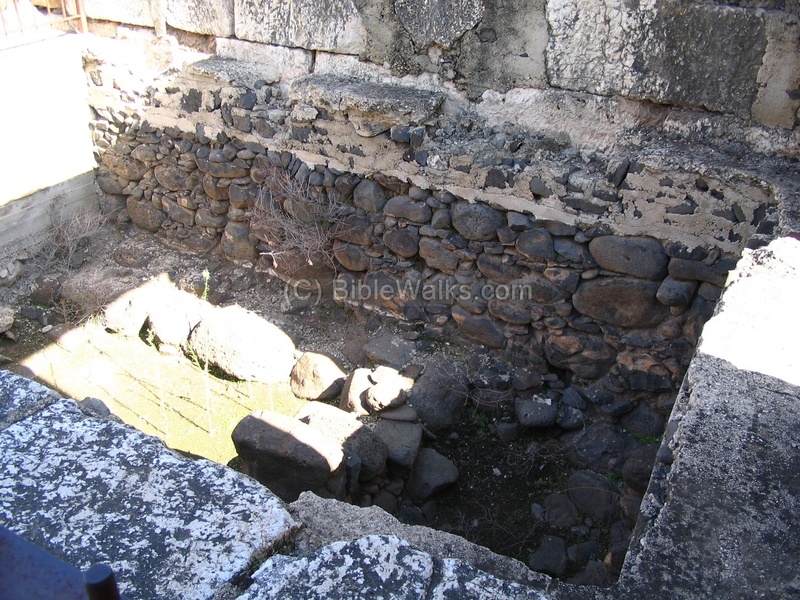 In the back of the Synagogue are the ruins of the Byzantine village, built with the local black basalt stone. 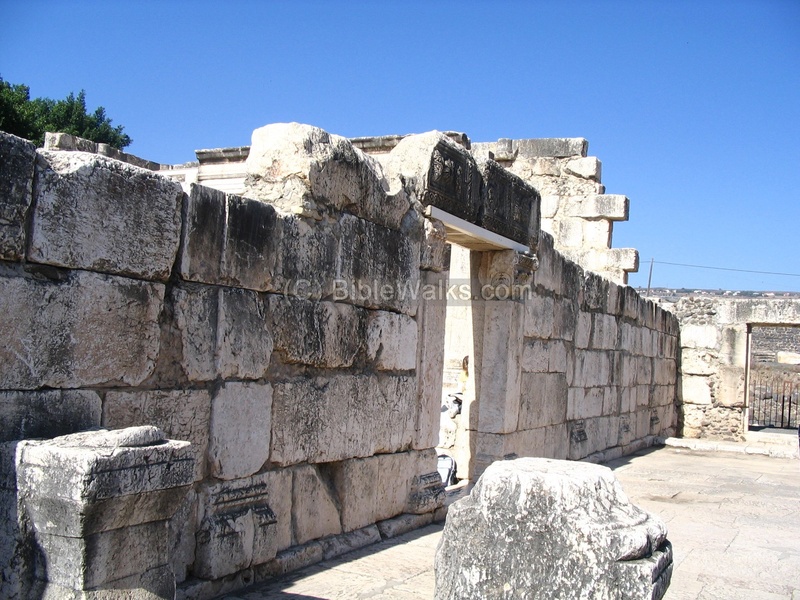 This photo shows the area between the synagogue and the 5th century church. The modern building, seen in the background, is the new church, which is built over the old church and the site of St Peter's house. Peter, also known as Simon Bar-Yonah, was one of Jesus's 12 apostles. He was a fisherman, and his house was located close to the shores of the lake. 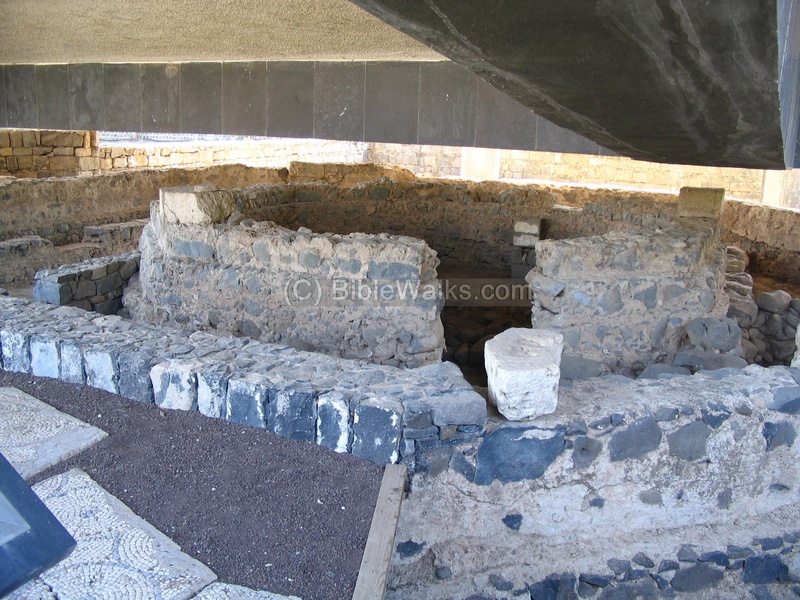 This site is believed to be his house, as verified by the archaeological excavations and the later building of a church over his house that was erected in his honor by the early Christian worshippers. The 5th century AD church, seen below, was built over St. Peter's house. It has the shape of an Octagon, which was typical of early churches and structures (such as Kathisma south of Jerusalem, and even the Dome of the Rock) . In 1990 a modern church was built over the 5th century church, over St Peter's house. 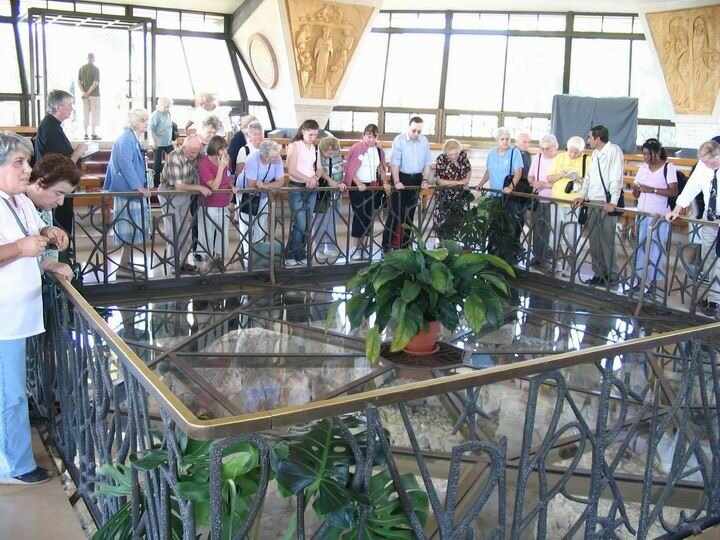 You can walk up to the main floor, which has a glass bottom in the center, and view the holy site. Through the glass window you can see the house of St Peter, and around it the Octagon Church. In the court yard there is a display of fragments of the large synagogue, part of them are seen in the background of the following photo. Also in display are industrial stone tools that were used at ancient times for farming, such as several oil presses, as seen below. 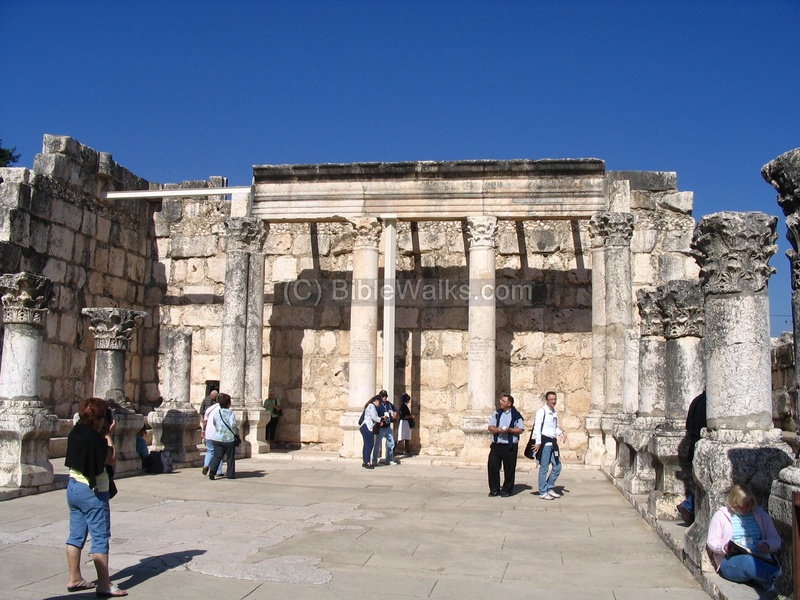 According to Mathew , Capernaum is "in the borders of Zabulon and Nephthalim". Actually, it is in the middle of the area of Nephthalim, since Zabulon eastern border is in Mount Tabor. "And leaving Nazareth, he came and dwelt in Capernaum, which is upon the sea coast, in the borders of Zabulon and Nephthalim"
"And Jesus, walking by the sea of Galilee, saw two brethren, Simon called Peter, and Andrew his brother, casting a net into the sea: for they were fishers. And he saith unto them, Follow me, and I will make you fishers of men. And they straightway left their nets, and followed him. And going on from thence, he saw other two brethren, James the son of Zebedee, and John his brother, in a ship with Zebedee their father, mending their nets; and he called them. And they immediately left the ship and their father, and followed him." "And they went into Capernaum; and straightway on the sabbath day he entered into the synagogue, and taught." "And came down to Capernaum, a city of Galilee, and taught them on the Sabbath days." "The country also that lies over against this lake hath the same name of Gennesareth; its nature is wonderful as well as its beauty; its soil is so fruitful that all sorts of trees can grow upon it, and the inhabitants accordingly plant all sorts of trees there; for the temper of the air is so well mixed, that it agrees very well with those several sorts, particularly walnuts, which require the coldest air, flourish there in vast plenty; there are palm trees also, which grow best in hot air; fig trees also and olives grow near them, which yet require an air that is more temperate. One may call this place the ambition of nature, where it forces those plants that are naturally enemies to one another to agree together; it is a happy contention of the seasons, as if every one of them laid claim to this country; for it not only nourishes different sorts of autumnal fruit beyond men's expectation, but preserves them a great while; it supplies men with the principal fruits, with grapes and figs continually, during ten months of the year and the rest of the fruits as they become ripe together through the whole year; for besides the good temperature of the air, it is also watered from a most fertile fountain. The people of the country call it Capharnaum. Some have thought it to be a vein of the Nile, because it produces the Coracin fish as well as that lake does which is near to Alexandria. The length of this country extends itself along the banks of this lake that bears the same name for thirty furlongs, and is in breadth twenty, And this is the nature of that place. " Footsteps of Jesus - This pictorial presentation is arranged by BibleWalks staff. Capernaum is listed in 18 of the 100 events.